Don’t be fooled by their name. Kitchen cabinets are not just for kitchens. In fact, there are many different uses for them outside of the kitchen. Using semi-custom kitchen cabinets is extremely valuable because they possess a polished look and offer an extremely efficient way to provide storage compared to other solutions. Using the same kitchen cabinets for all rooms in your home will create a guaranteed cohesive look while also saving you money. Just think, you can get all your cabinets from the same company and strike an awesome deal. At Fabuwood, we have the perfect semi-custom cabinet solutions to transform any room. Open floor plans are prevalent in new homes, which often means that the dining room is an extension of the kitchen. Semi-custom kitchen cabinets will enhance your dining room and are perfect for storing your fine china and other home decorations. Since dining rooms are generally used for entertaining or large family meals, it’s also a good idea to feature your best cookware in display cabinets with glass fronts. 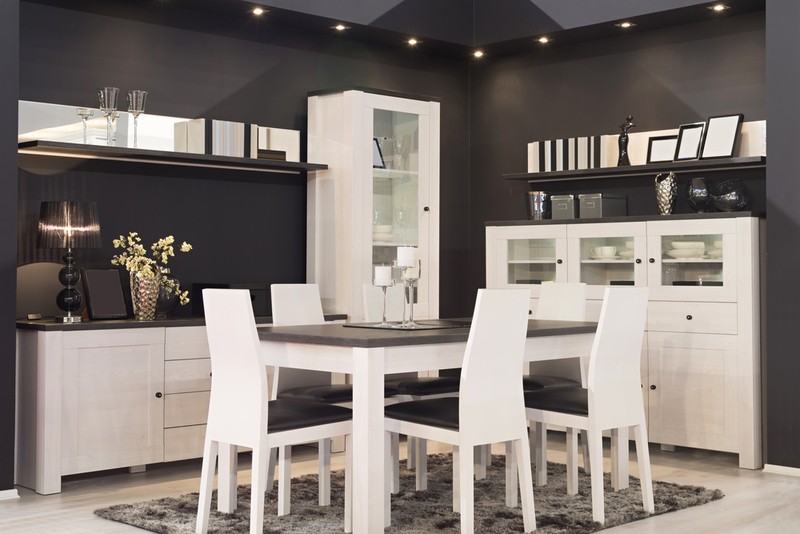 You could go one step further and match your cabinets to your dining room set for a more curated and refined setting, too. Everybody knows that a good party starts with a great bar—so why not equip your kitchen with an entertaining area truly worthy of your social affairs? There are a lot of tools that go along with a wet bar, so make sure you plan your storage accordingly. Open shelves or cabinetry keep everything in order. 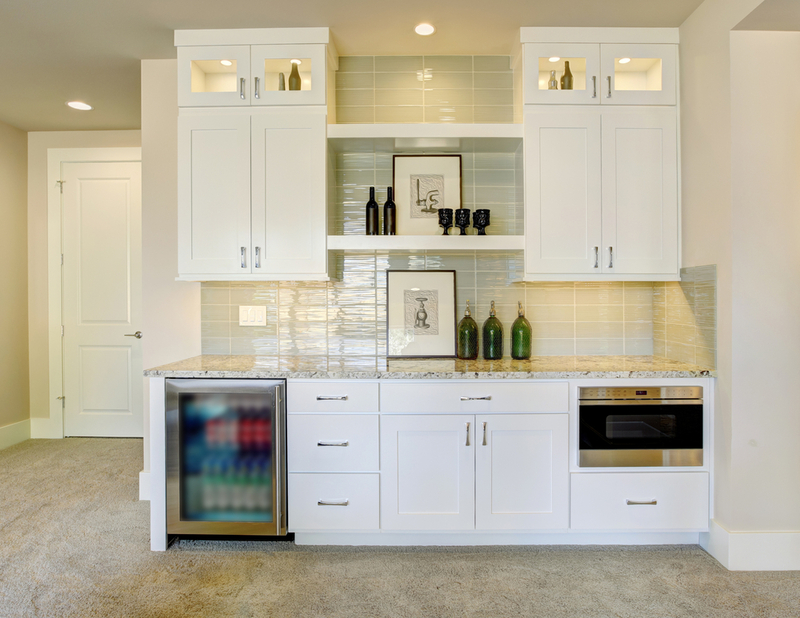 Consider incorporating cabinetry with glass doors to showcase your liquor, drink-ware and other accessories. If your cabinets are big enough, you can store anything from wine and glass racks, to ice buckets, mini fridges and beer kegs. It’s best to keep everything close at hand and organized, and you’ll surely impress your guests with this look. Many homeowners complain that they do not have enough storage when it comes to their bathroom layouts. New designs and styles of vanities and cabinets can give you plenty of space for all your toiletries, cleaning supplies and towels. Always remember - bathrooms get wet, foggy, and flooded. Therefore, it is wise to choose material that will not warp or become damaged when in contact with water or moist conditions. Since kitchen cabinets are typically larger than bathroom vanities, there exists more space for bathrooms contents. This also means there is extra countertop space to display your cosmetics, etc. With semi-custom cabinets you can customize the size requirements, so you really shouldn't run into any issues. Chic first floor home office features floor to ceiling white built-in shelves, cabinets and drawers illuminated by a white frosted glass jar lantern. Using semi-custom cabinets in your home office can produce both elegant and useful results. If you work from home, you know how hard it can be to control the clutter. Built-in cabinets will give your home office a much tidier aesthetic compared to a room full of scattered supplies and papers. Kitchen cabinets can bring a look of luxury to your office space and will help you keep better track of your papers and reports. You can even customize a bookshelf or built-in desk to keep everything organized and accessible. With many different styles and colors available you can select kitchen cabinets that compliment other pieces of furniture you already own. Use kitchen cabinets to freshen up and transform your laundry room into an appealing and functional space. Kitchen cabinets will keep bottles of soap, fabric softener, household cleaners and other supplies out of sight. You can also designate a cabinet for hiding hampers and for hanging laundry that does not go in the dryer. Semi-custom cabinets can be arranged to frame your washer and dryer or even completely hide these large machines. Cabinets are actually a great way to disguise a washer and dryer as they are typically considered an eyesore. While this technique can certainly be used in a laundry room, it can be especially useful when you don’t have a dedicated space to do your laundry. Using kitchen cabinets in a mudroom can greatly increase efficiency while also keeping the room as clean as it can be. These small spaces are generally used for housing jackets and footwear that are often dirty. Having cabinets in your mudroom gives you plenty of storage for gloves, hats, scarves, umbrellas and anything else you might need to brave the elements. Many homeowners use kitchen cabinets to create mudroom benches so that family members can easily remove their shoes before stepping into the rest of the house, too. The playroom is another space that can benefit from the neat appearance of built-in cabinets. We suggest opting for floor to ceiling cabinets, as they offer optimal storage space. Installing kitchen cabinets in your child’s playroom will not only help you bring a sense of order to your home, but will also add style and help you make the most out of your wall space. Cabinetry, drawers, shelving, and baskets also make for easy toy access and cleanup. Building designated drawers and baskets make it simple to go from playing with toys on the floor to placing them back in their respective storage areas. 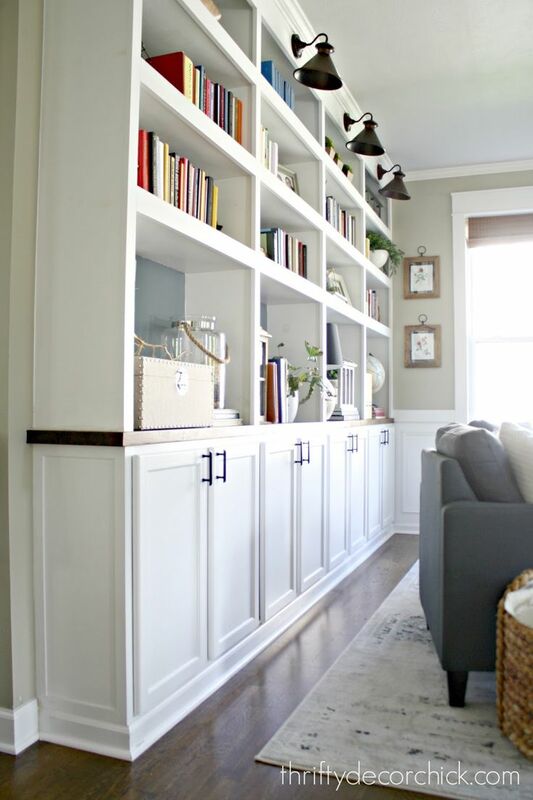 How to use affordable, unfinished kitchen cabinets to create built in storage and bookcases. You can use semi-custom kitchen cabinets to build a state-of-the-art entertainment center, as well. Majority of the time, stock entertainment centers do not suit your specific needs. So, using kitchen cabinetry is a lovely and clever solution. It is wise to arrange cabinets so there's ample space in the center for your TV. You can even remove cabinet doors so the cabinets look more like built-in structures. Before you buy the cabinets for your entertainment center, carefully measure each piece of equipment you plan to put inside of them. Just be sure to determine locations for drill holes and wires ahead of time. It's no wonder that kitchen cabinets have migrated to other parts of the home. Do you use kitchen cabinets as storage in other rooms? We’d love to hear about your kitchen cabinetry usage in the comment section below.